Dana Corbit here. What is it about writers and coffee shops? Comedians poke fun at them in their monologues. Coffee-shop owners count on them to keep their books in the black. These laptop-toting artistic types share table space with college students, traveling salespeople and crowds of chatting moms as they sip double espressos and type furiously on their versions of the great American novel. I know a lot about these people because I happen to be one of them. Several days a week I can be found in my favorite coffee shop, the Biggby Coffee franchise in Novi, Michigan, tapping away on my work-in-progress, making revisions or doing line edits. My double-tall skim vanilla bean latte is always within reach. In fact, I've hung around so often that the owner, Mike Waltersdorf, stocks my books now alongside his insulated coffee cups and greeting cards. I even plan a "Girls' Night Out Book Signing" at the shop each fall to hang out and share books with my friends. Are you asking if I'm there this very minute? Er...no comment. What makes coffee shops such great places to breed creativity for so many people? For some it might be the smell of coffee, but I doubt that's what it is for me. I never even drank coffee until the last few years - until I discovered lattes. Some might get inspiration from the TV entertainment, but Mike is attached to ESPN, so I don't even pay attention to that. Now the white noise, that's my thing. It's great having music playing and a bunch of people around me talking, especially when no one is talking to me. I love that noise. I know there are people out there who have to have total silence to work. I just can't relate to them. As a kid, I wrote all of my research papers in front of the TV. (Shhh, don't tell my daughters that.) And quiet libraries...I have about as much luck staying awake in those as I did in my college personal finance class. The coffee shop has other pluses for me. Telemarketers can't call and try to sell me vinyl siding. The dryer buzzer can't go off to tell me that the light load is finished. My pit of a house can't announce that its annual cleaning is long overdue. All that and the place has coffee, too. They're lucky I don't just move in. Well, I had better get back to work. The noise level is good, the music's just right, and the latte is kicking in. Ahhh! Let the creativity begin. Dana--well said, only the smell of fresh ground beans is heaven to me. But you are spot on...it really is about the people around you and the sense you are sharing in something good without saying a word. 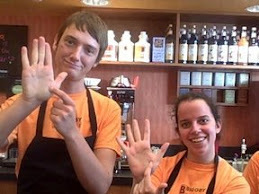 Now, if only I could convince my boss to let me work from Biggby Coffee every day :). You make me want to be at BIGGBY COFFEE working on my laptop... not quite sure what I would be working on but it sounds like a wonderful way to spend the days! Good luck on your next book! 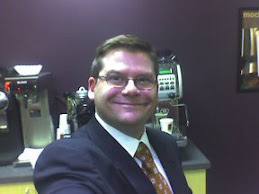 Thanks for sharing your thoughts and I love working in coffee shops as well. I'm the same way about white noise--there are only rare moments where I need to kill all the noise around me. There's just more energy (and ideas!) in environments that aren't quite so sterile. Glad that BIGGBY provides you with the proper environment to do what you do! Why is it called white noise? I have actually never seen TC "work" in a coffee shop yet! GREAT picture Mike and Dana! Very cool. When you publish the great American novel please remember Biggby Coffee and Mike W. in the acknowledgments. White noise, caffeine, music, TV, neighboring business people frantically responding to emails and making Twits (of themselves). Ah, Biggby Coffee!